We left Michigan driving towards Ohio! Our first stop in this state was Cincinnati. We had made a reservation for a bed and breakfast in that city before we left Montreal since we tough we might be needing this night in a real bed (can’t remember our last shower also…). 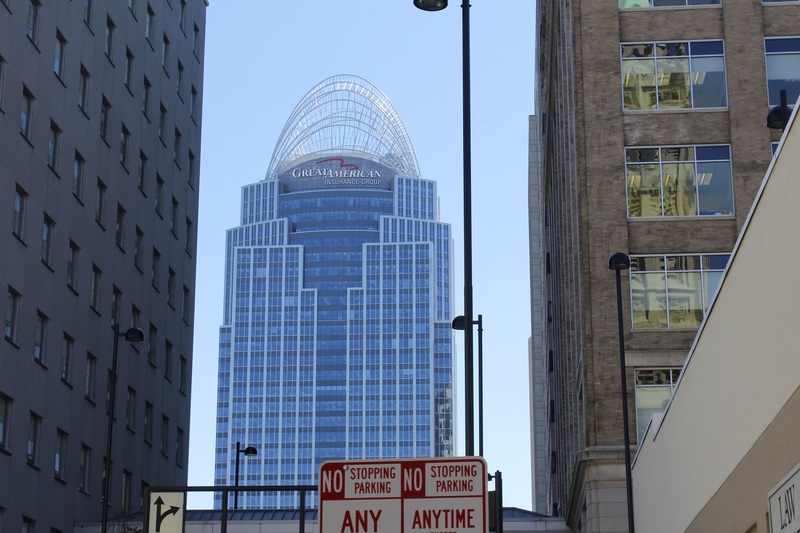 For a good price, we could walk to downtown Cincinnati in less than half-an-hour on foot. We took the time to walk around Cincinnati a little since it was a really gorgeous day. We stopped to visit the National Underground Railroad Freedom Center. 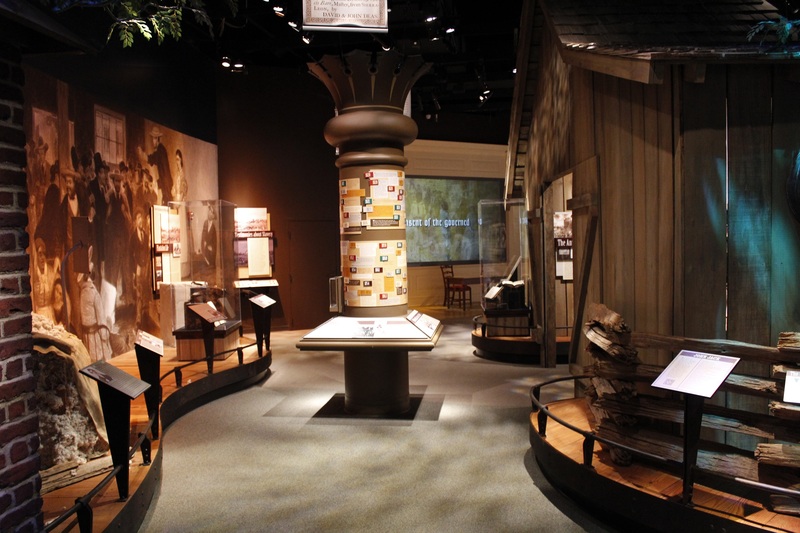 This center host many exposition rooms that relate the story of slavery in America and the famous Underground Railroad. For those who never heard of it, it was the name given to the system used by slaves to escape to abolitionist states, Canada or Mexico. The runaway slaves could stop at safehouses where people would hide them and give them food for the night. They would also guide them through the path to liberty. Cincinnati, located on the Ohio River, was an important location of that system. Inside, we found a lot of information and documents that dated from the coming of slaves to America to the declaration of emancipation addressed by Abraham Lincoln in 1863. We learned the diverse tactics the slaves would use to escape and to hide. Some other rooms were about modern slavery and African American arts. 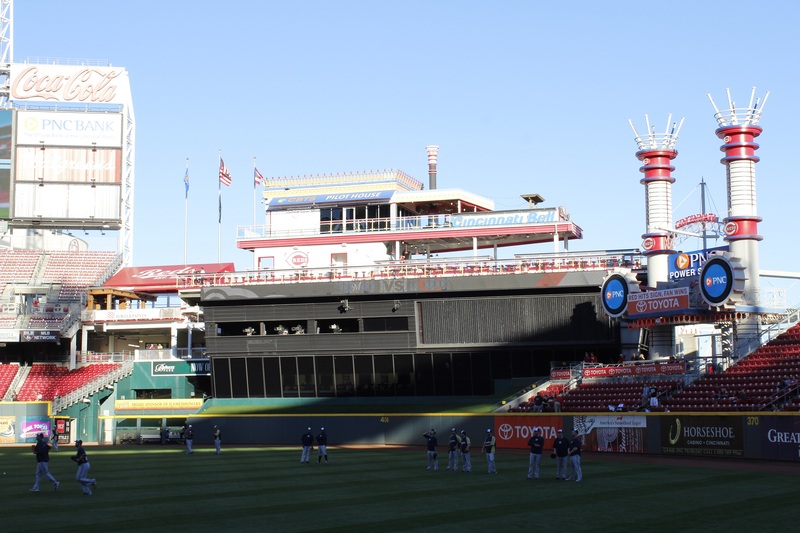 After our visit, we headed to Great American Ballpark of Cincinnati. First we have to say that this is a corporate name. We tough it was named like this to represent the great American past time of baseball but it really is the name of an insurance company: Great American insurance. We had a meeting with Michael Anderson, working for the Cincinnati Reds for Community public relationships. 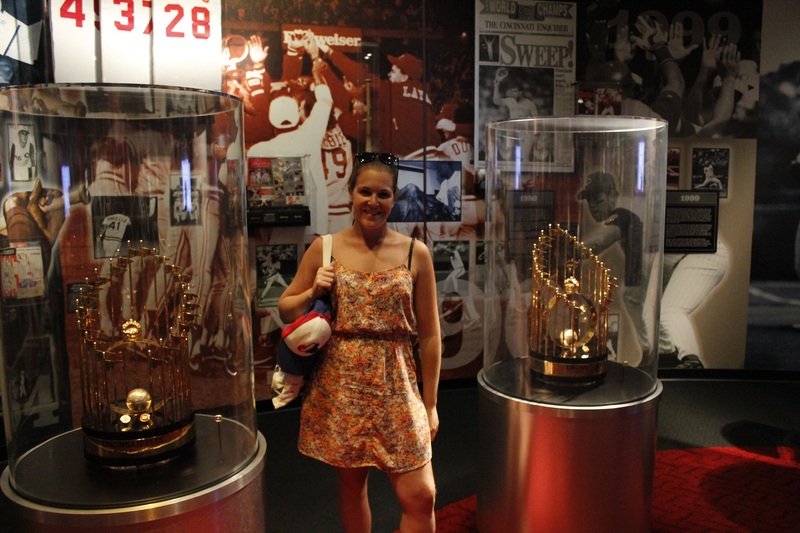 Before meeting him, he sent us with courtesy tickets to the Reds museum and hall of fame. 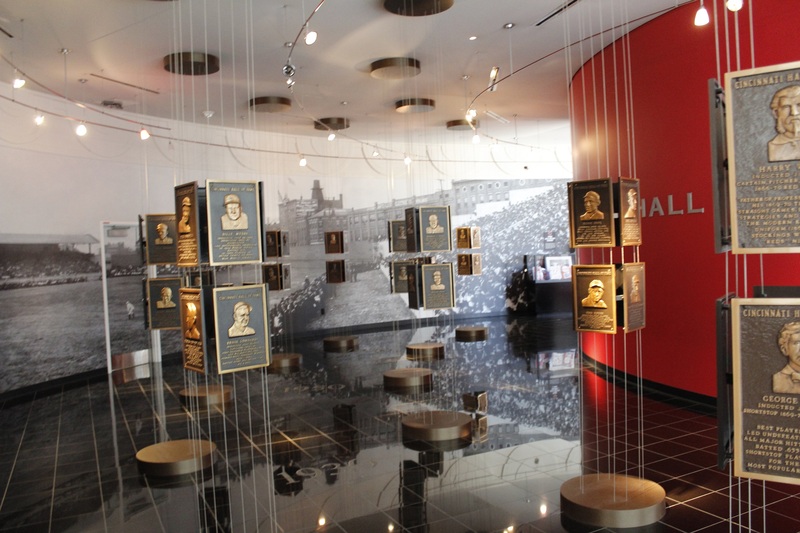 This hall of fame and museum was opened one year after the ballpark. 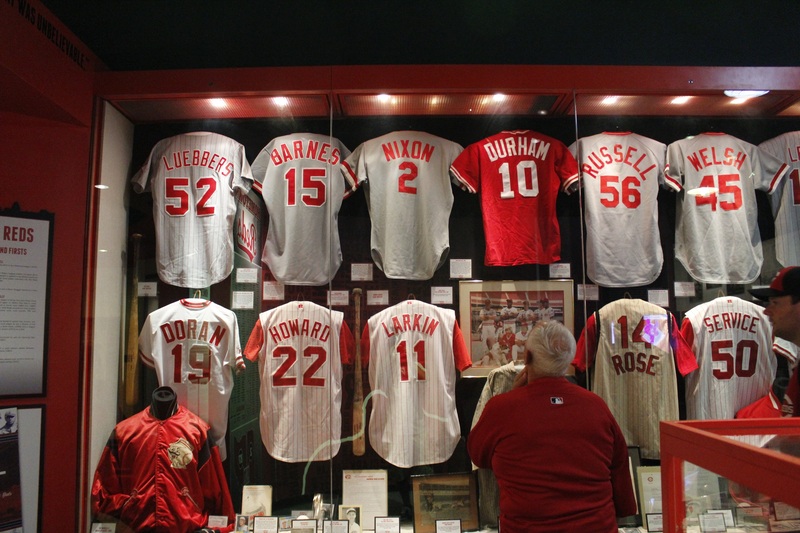 In it, there is a lot of baseball memorabilia representing the Reds history. 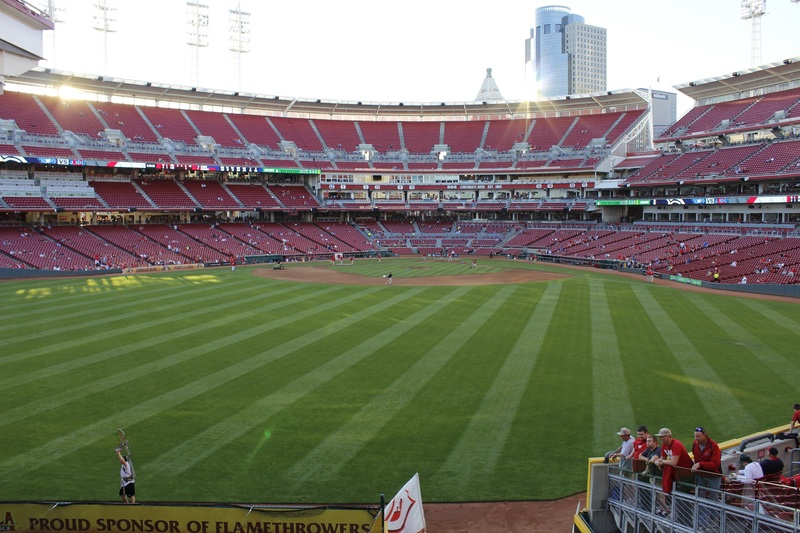 The Reds are known to be the oldest baseball organization in the history of the sport. They are really proud of that heritage. They saw many great baseball players like Frank Robinson and Pete Rose. The museum is rich with information and interactive zones. We finished the visit with the hall of fame of the team. 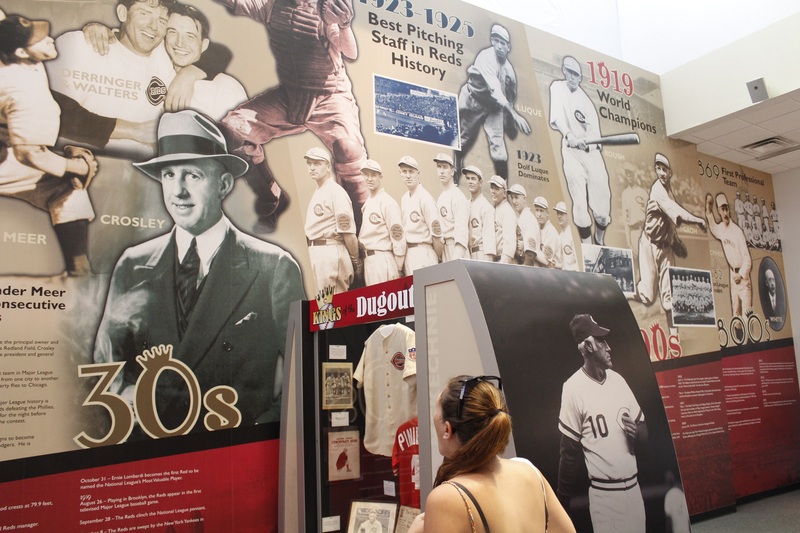 We really recommend the visit of that museum to fans visiting the ballpark. We finally met up with Michael Anderson right in front of the main gates of the ballpark so we could talk baseball. 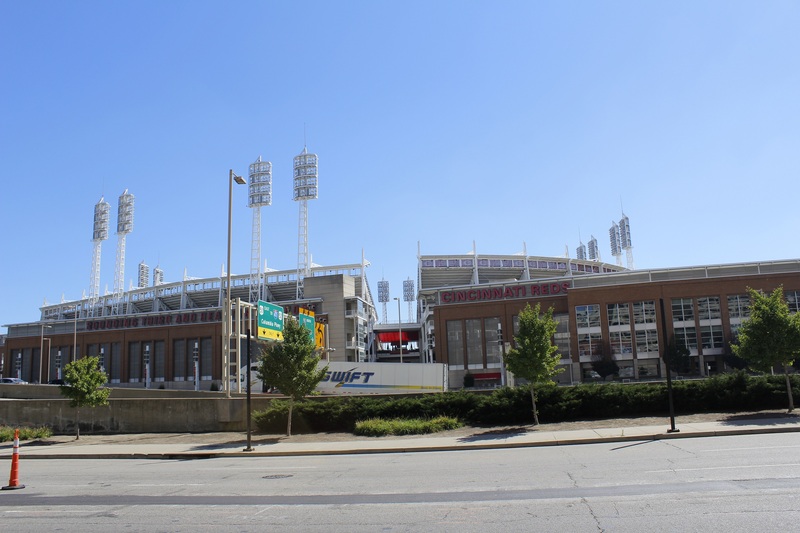 Cincinnati is the smallest market in all of the Major league of baseball. How did the team managed to survive? 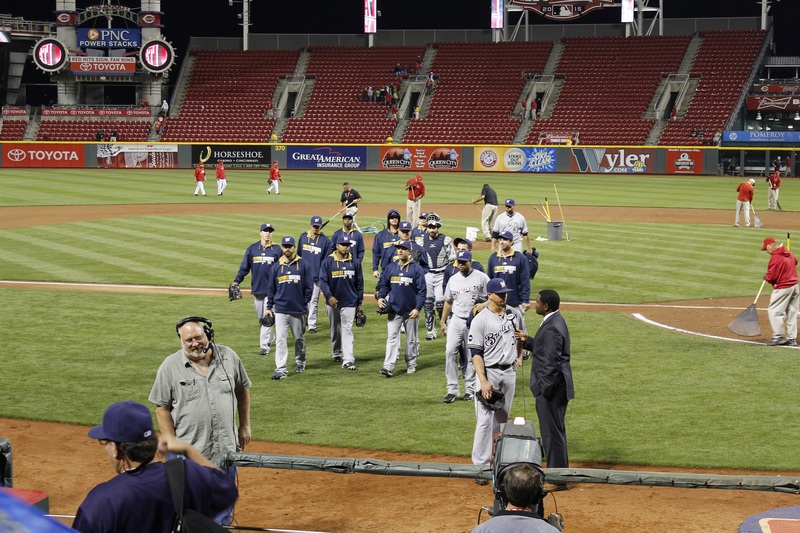 In Cincinnati, the team created a close relationship with the fans. The fans and the team are really bonding altogether. As an example, Michael told us that having an orchestra doing a post-game show with fireworks won’t really drag many more people to the game but the fans that will attend this event would be very happy about it. 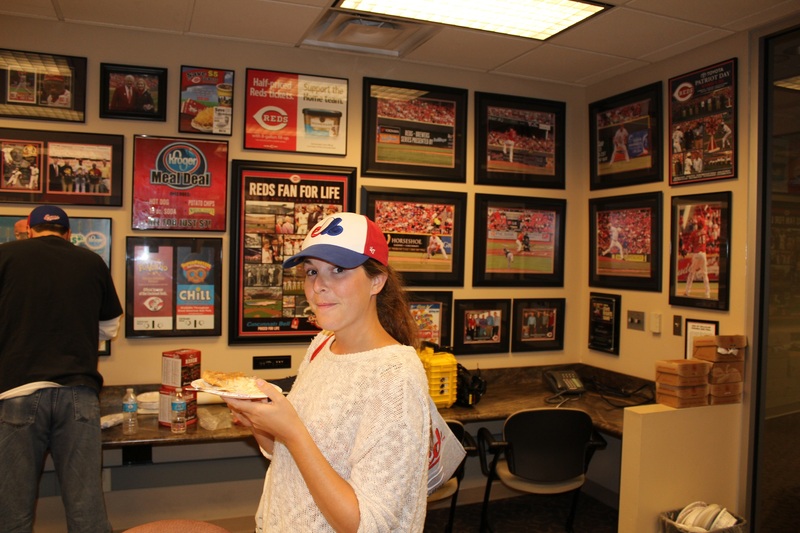 It’s not all about the money; the fans have to be happy when visiting the ballpark. We have to say that money was a big question in Cincinnati. First of all, the construction of the ballpark was financed by the taxpayers of the city. A tax was created to raise enough money for the construction of a baseball field and a football field. Only problem is that the construction of the football field took over 2\3 of the budget and left crumbles for the ballpark. This is why some parts of the ballpark feels like they have ran out of money. Also, the team had to spend a lot of money in the last few years to get great players playing for the team. Sadly, some of them seemed to stop playing well on long term period and now management is stuck with those big contracts for, in some cases, a long time! At the beginning of the 21st century, the team had trouble dragging a lot of people to the ballpark. They decided to hire a lot of special workers that would be focusing on the fan experience and bringing more people to the ballpark. Also, when the ballpark opened in 2003, there were practically no places to get a meal or a drink in the surrounding area. People were not hanging around the ballpark before or after the games. 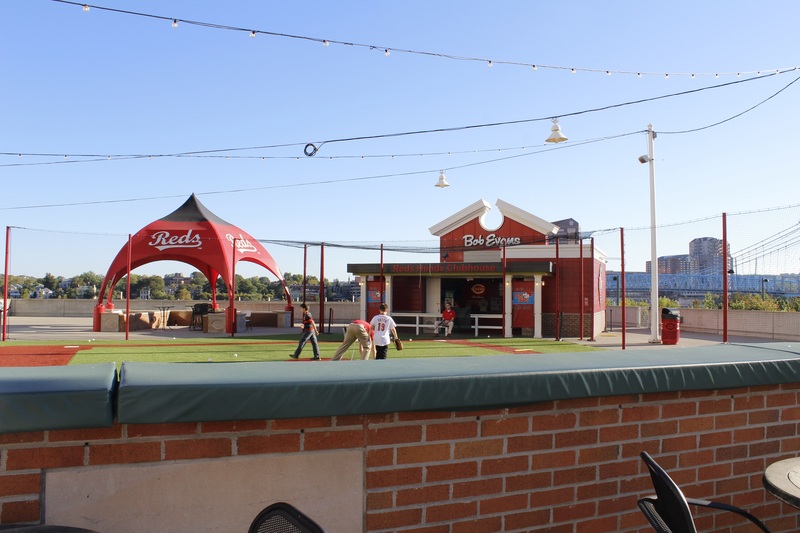 In the last few years, many sports bars and restaurant have opened next to the ballpark and gives life to the area before and after games. One particular bar, the Holy Grail, is supposed to be THE place to go for all Reds fans before games! By the way, we have been told by Michael that opening game in Cincinnati is really a big happening. They would close the streets to cars and people take the day off to get into this big party around the ballpark. We hope to attend one of these opening day games any time in our lifetime! Talking baseball history, the Reds had some great baseball era. The most popular one is obviously the Big Red Machine era in the 70’s. This team won 2 World Series during that period. It is during that period that Pete Rose played for the Reds. Pete Rose is known for two things in baseball. First, for his multiple major league records: most hits, most game played, most at bats, most singles (etc.) in the history of baseball. The second thing for what he’s sadly famous is because he was banned from baseball for gambling on baseball games while he was playing and managing for the Reds. We asked Michael what was left from Pete Rose in Cincinnati. Every time the team wants to honor him in any way, they have to get a special permission from the MLB. The fans in Cincinnati still love him and he confessed betting on games but never against his team. Many think that he deserves a spot in the Hall of fame in Cooperstown. We kept touring the ballpark as we walked by a kid zone: batting cage and a Whiffle ball field. Michael showed us a special food vendors section where it was mainly food coming from the Cincinnati’s area. Right next to that, a very long bar sells many types of beer, a lot are from craft breweries located not too far from the city. He also showed us the Riverboat deck. This reproduction of an old steamboat is actually a section that people can reserve for small or large group in a party atmosphere. The boat’s chimneys are shooting fire for every Reds strikeouts or home runs. The boat is a great historical figure for the city. We want to give a big thank you to Michael for helping us and answering our questions! 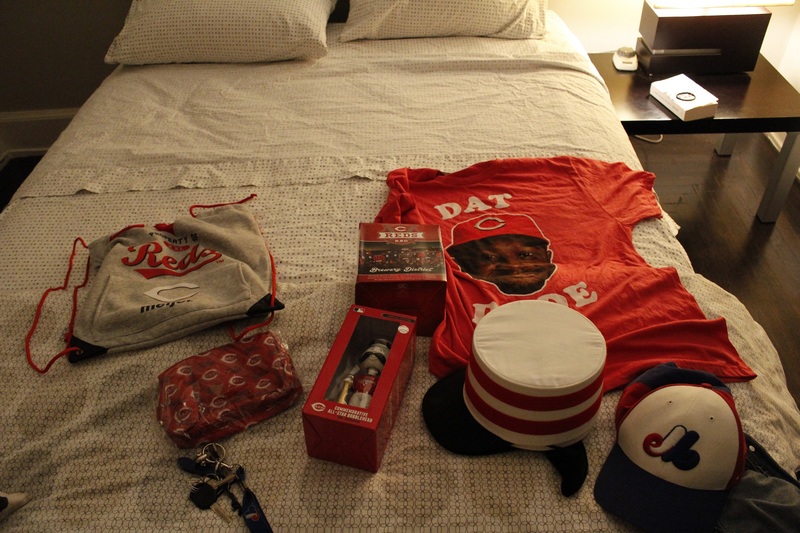 Thank you also for the gifts from the Reds: I really wanted the old school hat with the mustache! Before getting to our seats, we met up with Tony, a Reds fan that had given us the good email to contact the team! 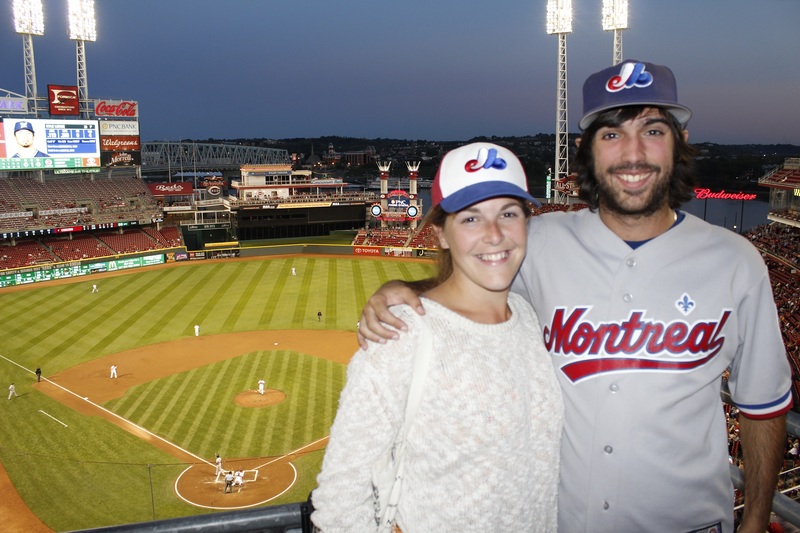 He was proudly wearing his Expos hat that night. Michael came and sat with us to begin the game and we talked a lot about baseball. We asked him how were the Reds fans feeling after getting to the playoffs in the last years but losing in the first round or the wild card game like last year. He told us that the fans were already getting impatient. They announced that we were 27,000 fans last night at the ballpark but we must’ve been around 15,000. Season tickets holders don’t come to the games. Tony and his family are pretty close to the Reds organization since his brother is working for the team. We felt that all the fans are really close to the organization. Tony’s mom, who attended the game, had brought apple and pumpkin pie (that was delicious!) for the people working on the press gallery level. Apparently, she has got a reputation from the away team workers that got to know her pies! We sat with them not too far from home plate and we kept talking baseball. They too told us about the big hype going around the opening game day! We asked Tony if Cincinnati was a baseball city and without any hesitation he said yes. 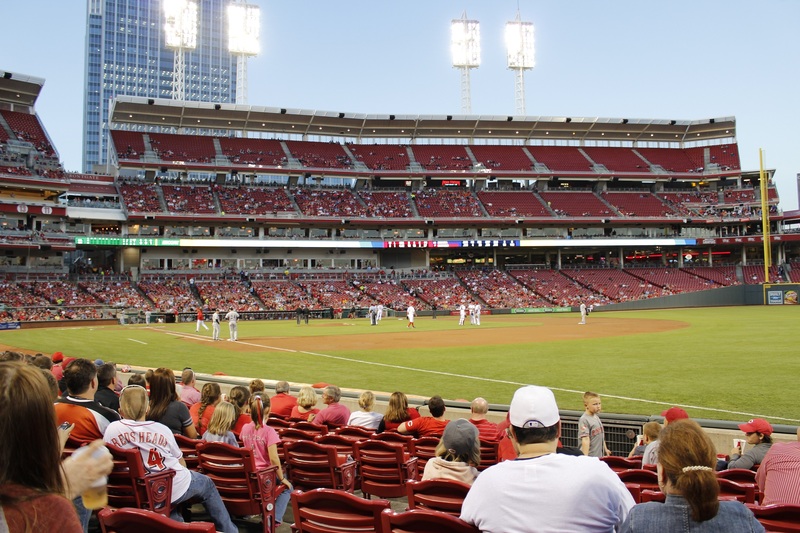 The Cincinnati Bengals (NFL team) also are important to sports fans but they had so many rough years that people been more turned towards baseball. We shared a great culinary experience with Tony: a skyline cheese dog, a meal particular to Cincinnati! With a lot of cheese please! We went up with them up on the press gallery to take a quick look around and grab those empty pie pans! It seemed like everyone really enjoyed it! We thought that the atmosphere at the ballpark was really friendly and that all of the employees were really nice to all the fans. We almost forgot that there was a game that night! 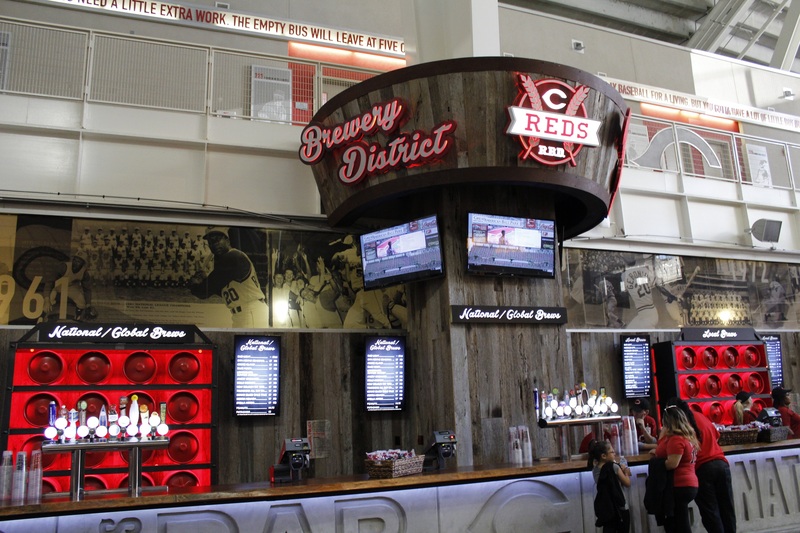 The Reds were playing against the Milwaukee Brewers. The starting pitcher for the Reds was Daniel Corcino and Kyle Lohse was the starter for the Brewers. Play of the game was early: 3rd inning, Billy Hamilton saved a home run by jumping at the wall and doing an awesome catch. Sadly he would get a concussion on the play and he wouldn’t be back in the game. Corcino got in trouble in the 4th; he will allow a run to the Brewers but Jason Bourgeois would do a great relay to 2nd base to end the inning. In the 5th, Corcino would allow a double to Carlos Gomez good for another run. That would be the end of his game. The Reds pitchers were not in a good mood on that night: they would allow 10 walks and only get 4 strikeouts. In the 8th inning Jean Segura would push 2 runners’ home with a double and Kyle Lohse would get a sacrifice fly good for another run: 5-0 Brewers. Lhose would pitch the whole 9 innings getting 6 strikeouts and only allowing 2 hits to the Reds. Final score 5-0 Brewers. 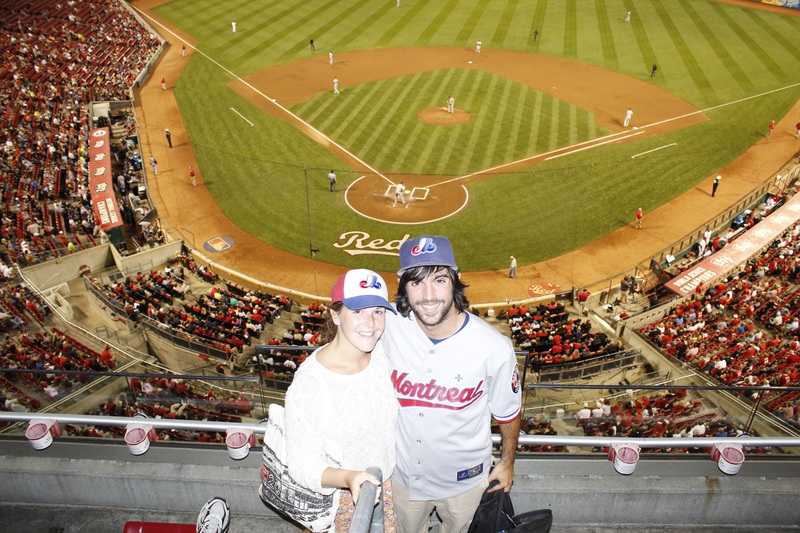 Cincinnati is the smallest market in the major league of baseball and Montreal is also considered to be a small market. We realized that, in Cincinnati, everything seemed to be made so the fans would feel really close to the team. It’s a little like if every fan was important out there, a thing that we could not say we’ve seen a lot this summer. The city is baseball. They will all get excited over their players or on those special moments like a homerun that would pushed the team in post seasons. 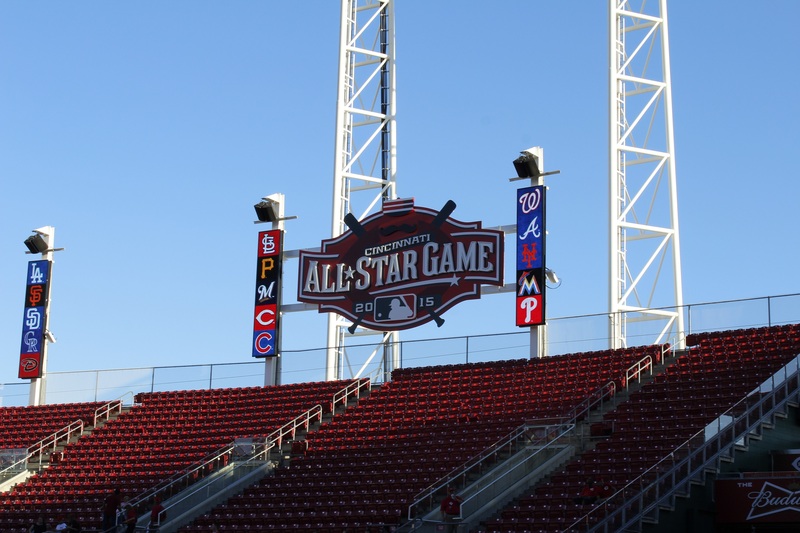 The Reds will be hosting the 2015 All-Star game at Great American Ballpark. As Michael told us, it is a free pass next year so the team doesn’t have to be that good since all the attention is going to be around the all-star game. But after that, the organization will have to work harder to put a winning team on the field and a team that will be a serious contender for the World Series. We wished them luck in their 2015 season. We have to give a big thanks to Michael for helping us out and answering our questions. It’s really helpful for us to meet with team representatives. Thanks also to Tony and his mom. They are two real baseball fans! We will see them again on the next day but that will be in our next report! We are on our last stretch: next stop Cleveland. P.S. Did you know that between 1967 and 1999, facial hairs were prohibited for the Reds players? Pretty ironic for a team that is using a mustache as a marketing logo!